First OEM to provide Collision Mitigation System (CMS) and Lane Departure Warning System (LDWS) solutions, based on a combination of camera and radar, optimized for India’s operating conditions. Additional safety technologies include Electronic Stability Control (ESC), Automatic Traction Control (ATC) and Hill Start Aid (HSA) on the PRIMA and the SIGNA range of trucks. 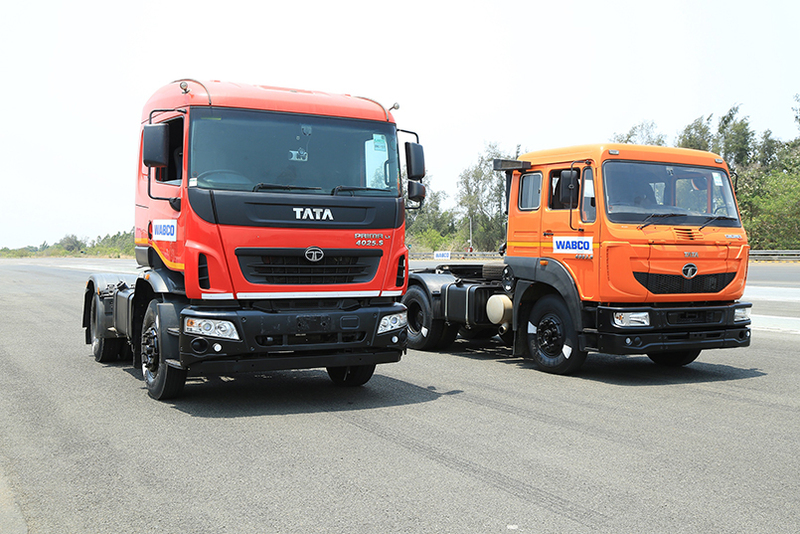 The commercial vehicle Business Unit of Tata Motors is forging ahead with the development of safety-enhancing advanced driver assistance system solutions for deployment on its medium and heavy duty commercial vehicles. This ambitious goal is aimed at reducing the number of road accidents, increasing vehicular as well as occupant safety, in a broad range of visibility conditions. Offering enhanced operational efficiency the systems will also help reduce operating costs for fleets. After becoming the first OEM to deploy Electronic Stability Control (ESC) for medium and heavy duty commercial vehicles last year, Tata Motors is today announcing the availability of a range of new safety technologies. The Advanced Driver Assistance Systems (ADAS) being offered by Tata Motors include a Collision Mitigation System (CMS) and a Lane Departure Warning System (LDWS) for PRIMA and SIGNA trucks. Working in collaboration with WABCO India, Tata Motors will implement WABCO’s pioneering technologies which have been optimized for India’s operating conditions. Designed to help mitigate some of the most common causes of accidents involving commercial vehicles, advanced driver assistance system solutions enhance vehicle safety, driver comfort and effectiveness. Through this partnership, Tata Motors becomes the first OEM to provide a host of specific safety technologies in their vehicles, including Electronic Stability Control (ESC), Automatic Traction Control (ATC), Hill Start Aid (HSA), a Collision Mitigation System (CMS) and a Lane Departure Warning System (LDWS). Advanced Driver Assistance Systems (ADAS) for medium and heavy duty commercial vehicles relies on sensors, such as radar and camera, to provide enhanced vehicular and occupant safety. Helping to mitigate driver error, these systems are capable of identifying a variety of different road traffic hazards to enhance driver and vehicle safety. Furthermore, integration of advanced driver assistance systems in the vehicle can help ensure the on-time delivery of goods by improving driver comfort and effectiveness as well as reducing accident downtime and related costs, for example. Research conducted by India’s Ministry of Road Transport and Highways on Indian expressway and highway accidents reveals that the majority of road fatalities are caused by loss of vehicle control resulting in rear-end collisions, unintended road departures and vehicle rollovers. Helping to reduce driver error, Collision Mitigation Systems, Lane Departure Warning Systems and Electronic Stability Control will significantly enhance commercial vehicle safety on India’s roads. The WABCO Collision Mitigation System (OnGuardASSIST™) implemented by Tata Motors, alerts the driver to potentially critical driving situations via acoustic, visual and haptic signals. Should the driver fail to take corrective action, the system provides active braking on moving and stopping vehicles to mitigate or prevent impending rear-end collisions. The system utilizes a powerful 77GHz radar sensor that maintains the system’s high performance in all weather conditions. Its superior performance is particularly vital in poor visibility situations such as heavy rain, dense fog, blinding sunshine and night-time driving when camera-based sensors used on other collision mitigation systems may be impaired. Warns of moving, stopping and stationary vehicles ahead even in poor visibility conditions. The WABCO Lane Departure Warning System (OnLaneALERT™) implemented by Tata Motors will help prevent unintentional lane departure, one of the most common causes of accidents involving commercial vehicles. The system utilizes a forward-looking, windshield-mounted camera to monitor and calculate the vehicle’s position within the lane. When OnLaneALERT detects the vehicle crossing lane markings without the turn signal being activated, the system sounds an audible warning. This alerts the driver to take corrective action to prevent potential collisions and lane departure related road accidents. Tata Motors Limited is India’s largest automobile company, with consolidated revenues of INR 269,850 crores in 2016-17. Through subsidiaries and associate companies, Tata Motors has operations in the UK, South Korea, Thailand, South Africa and Indonesia. Among them is Jaguar Land Rover, the business comprising the two iconic British brands. It also has an industrial joint venture with Fiat in India. With over 9 million Tata vehicles plying in India, Tata Motors is the country’s market leader in commercial vehicles and among the top in passenger vehicles. Tata cars, buses and trucks are being marketed in several countries in Europe, Africa, the Middle East, South Asia, South-East Asia, South America, Australia, CIS and Russia. WABCO India Limited is a leading supplier of technologies and services that improve the safety, efficiency and connectivity of commercial vehicles in India. Powered by its vision for accident-free driving and greener transportation solutions, WABCO India excels in pioneering breakthrough innovations that bring industry-leading solutions to the commercial vehicle industry in India and worldwide. The company is a world-class manufacturer and local market leader in advanced braking systems, conventional braking products and related air assisted technologies and systems. WABCO India operates five manufacturing facilities across India, an advanced technology development center, a vehicle testing facility and a nation-wide aftermarket distribution and services network. Headquartered in Chennai, WABCO India is committed to the long-term success of its customers by leveraging WABCO’s powerful global technology portfolio. WABCO India reported sales of Rs.2103 crores in FY 2016-17. For more information, visit www.wabco-auto.com/en/wabcoindia/home.